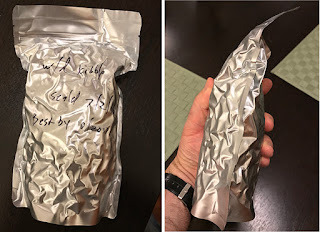 Today I’m sharing a tip about preserving dry emergency supplies, from a chance observation that I was surprised to make a couple of years ago. Most of my emergency supply food is in the form of MREs, emergency food bars, and canned food. 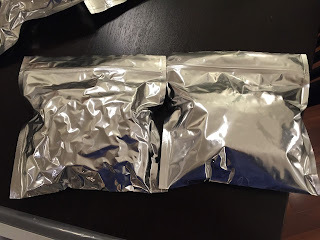 However, I also wanted to store away a few small bags of my dog’s kibble (dry food), so I parceled out portions into a couple of heat-sealable Mylar bags to be sealed and stored in my emergency kit. 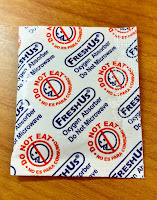 To ensure that they were adequately preserved, before sealing each one, I tossed in a fresh oxygen absorber packet, the kind that you commonly see in sealed bags of jerky and other preserved foods to remove oxygen from the sealed contents and avoid oxidation. These sealable Mylar bags and oxygen absorbers are easy to find online. I also took the same approach to preserve some dry dental hygiene treats (yes, still for the dog) that I could only get in a large bag; I wanted to preserve smaller bags of them and open them successively over a couple of years. This was not for the emergency supplies; it was simply a way to stretch the contents of the large bag over a longer time than I felt they would last after opening once air got in. No, I haven’t gotten to the surprising part yet. In both cases, I pressed as much air out of the bags as I could before heat-sealing them, but since the contents were dry hard pellets, it was impossible to get rid of ALL of the air since the air left between the hard objects could not be pressed out. That means that the bags right after sealing were firmly enveloping the hard contents but the outside surfaces of the bags were smooth and flat. However, when I looked at the bags the next day, in both cases, I was surprised to see them appear to have been shrink-wrapped and vacuum-sealed, even though neither was the case. That is, there were invaginations in the bag surface between each pellet, it looked like crinkled foil, and it was completely stiff with no movement at all of the contents inside! As close to a perfect vacuum as one could get with no actual vacuum device! I would not have guessed this in advance, but the oxygen absorbers apparently were able to remove enough gas from the sealed bags that they effectively vacuum-packed themselves. 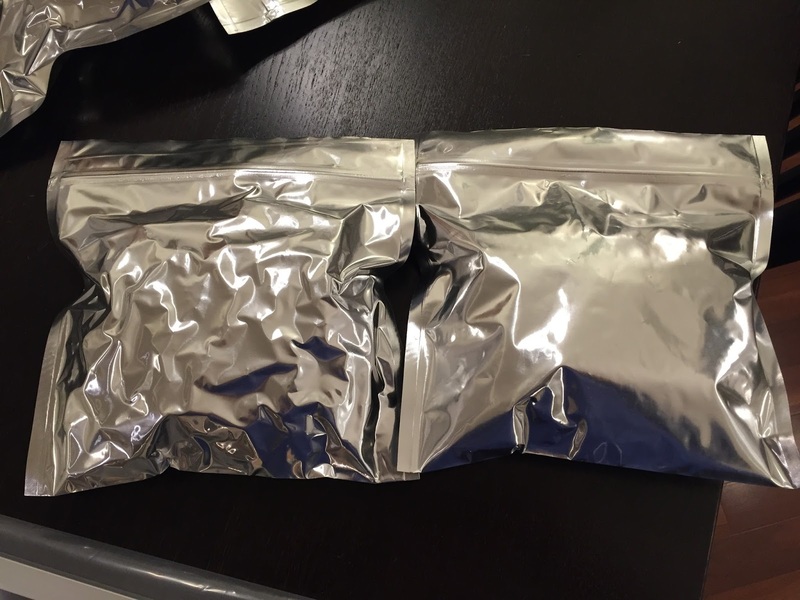 This is shown in the photo of the dental treat bags, in which the bag on the left was sealed the day before, and the bag on the right was just sealed a few minutes before the photo was taken. And yes, that bag on the right looked like the bag on the left the next day. The next pair of photos shows one of the kibble bags that I just removed from my emergency kit to photograph, viewed from the front and side. It’s as tight as it can be, like a brick, completely vacuum packed still nine months later. 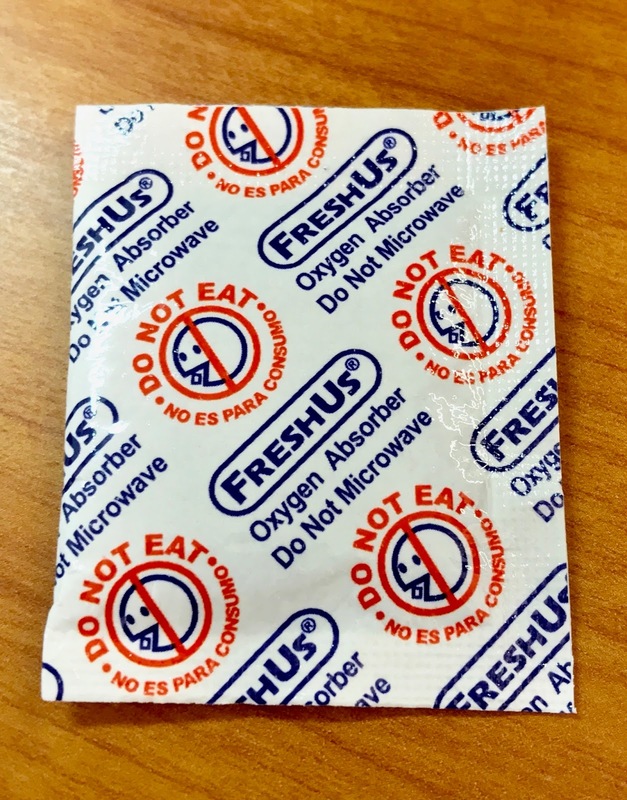 Perhaps a chemist will weigh in here; I was a bit surprised since air contains only ~20% oxygen (78% is nitrogen), so if the oxygen absorber only absorbs oxygen, I would not have expected it to effectively remove all of the gas from the bag. However, I’ve done this several times and it always happens. So you can actually vacuum-seal and preserve dry supplies even if you don’t have a vacuum sealer, just as long as you can heat-seal bags and have oxygen absorbers. By the way, a few years ago, I had an e-mail correspondence with a representative from Pack Fresh, one of the companies that manufactures oxygen absorbers and sells them on Amazon. I learned some interesting tips about preserving supplies in heat-sealable ziplock bags; that is, the bags that have a ziplock top but then extra material beyond the ziplock part that you can heat-seal (the bag is completely sealed until you rip the top part off and then you can re-close it with the ziplock). That ziplock part is just plastic, not Mylar, and I was surprised to learn that oxygen goes through even the closed ziplock because the plastic is somewhat permeable to oxygen. That means that if you take an ordinary plastic “Ziploc” bag and close it, oxygen can still get in. If you have a Mylar bag with a ziplock top that is closed, oxygen still gets in, more slowly. You need to heat-seal the opening of the Mylar bag to truly keep the oxygen out. This means that if you put supplies into even a Mylar ziplock bag with an oxygen absorber and just close the bag with the ziplock part, oxygen will ultimately get in and overwhelm the oxygen absorber, and you will not have successfully stored away the contents. For that reason, you should heat seal the top of the bag for long-term storage, and then when you ultimately open it, you can use the ziplock closure for subsequent closing for short-term storage. 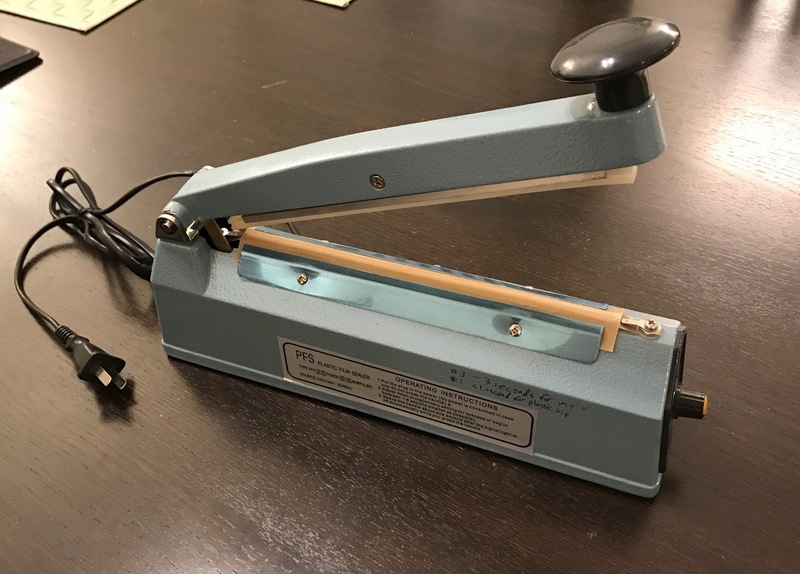 He also told me that while an actual heat-sealer (like that used for Seal-a-Meal bags, the photo shows mine) is great, many people just use a clothing iron or a hair iron and that works as well. Of course, if you really want to go all-out and your bag contents are dry, you can also toss in a desiccant packet before sealing the bag. Interestingly, a comment was left on my recent article about keeping emergency cash in emergency kits, from someone who had put some paper money in their kit and opened it years later to find that it had gotten moldy! I checked my paper envelope of emergency cash and it is fine, but I guess if you suspect that moisture might be a problem, you could also seal emergency cash in a Mylar envelope with a desiccant packet inside. So there you have it; how to shrink-wrap bags with oxygen absorber packs. However, this doesn't work for everything; please don't attempt to reduce your waist size by eating oxygen absorbers!